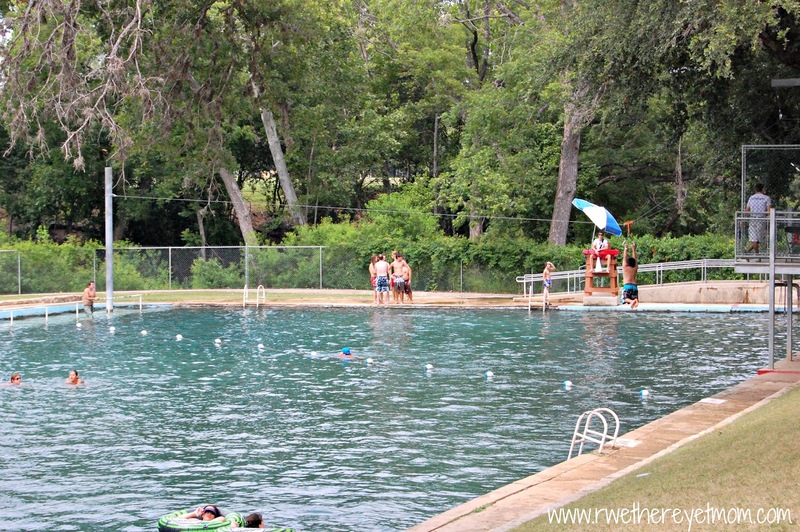 A very unique and cool place to be this summer is in the spring-fed waters at the Landa Park Aquatics Complex in New Braunfels, Texas. 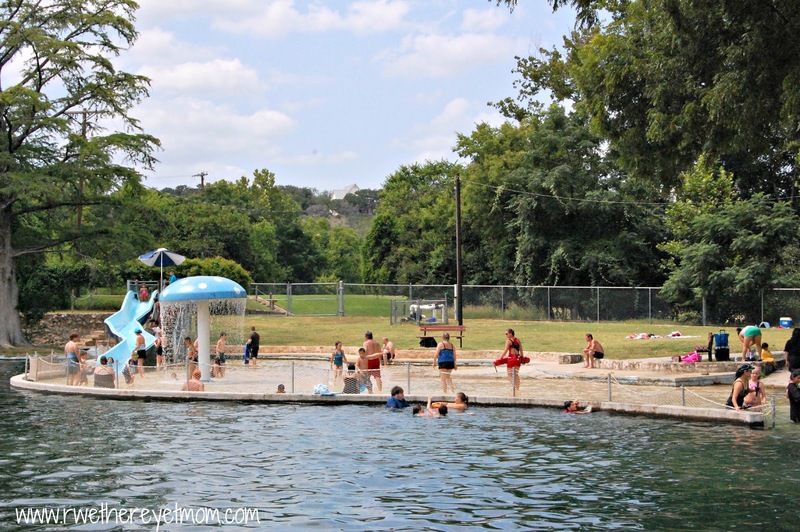 As a child, heading to Landa Park was always a treat – mainly because of this amazing pool. Built in the early 1900s, it is one of the oldest and most historic bathing pools in Texas. It is springfed by the Comal Springs and remains a wonderful 72 degrees year round. 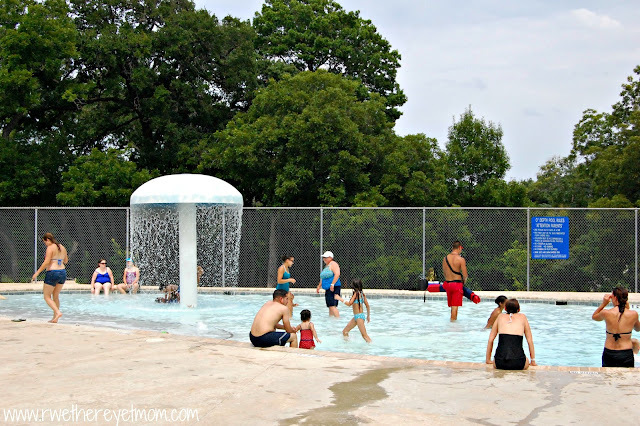 When we visited back in June, we were amazed at all the fun things there are to do here! Kid after kid came zooming down this zip line, cheerfully dropping into the middle of the pool. There is also an overhead cargo net to climb and a rope swing. On the other end of the pool, there is a shallow end with a 10-foot tall slide and a mushroom fountain. But the true highlight of this pool and what really got my kids excited was this 2 story tall Wet Willie slide. Both kids went nuts over this slide. Having a 3 year old, I love pools that can excite the older 2 and keep the little one entertained. 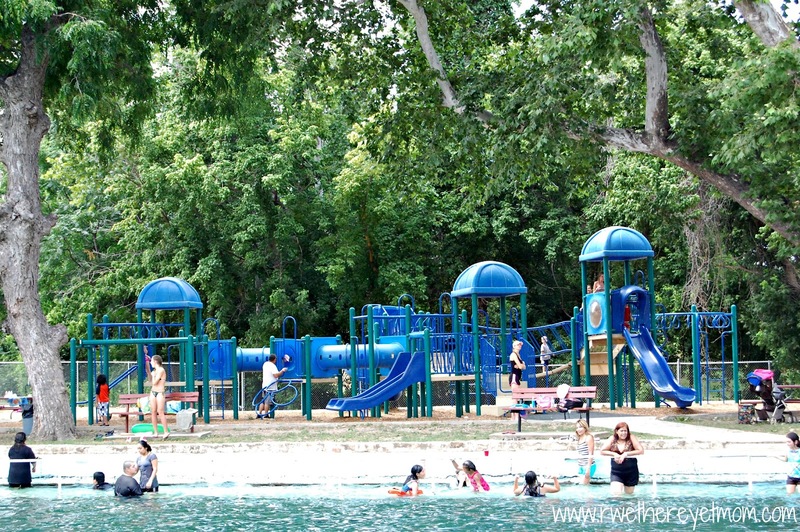 On one side of the pool, under beautiful oak trees is this amazing playscape. 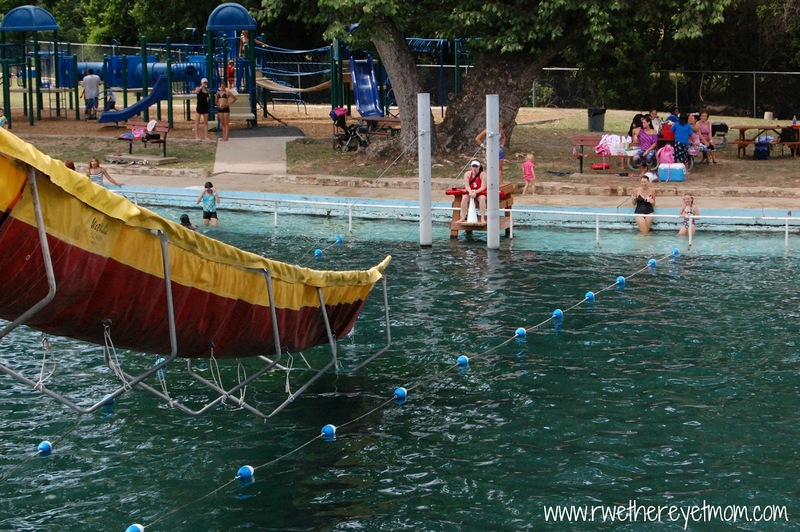 When my little guy tired of the pool, he was happy to play on this. And if you didn’t want to swim in the (sometimes) cold spring fed pool, there are the zero-depth pool and Olympic pool at the top of the hill. I loved this pool as the water was incredibly refreshing and was shaded so very well. The “toys” made it a ton of fun for older kids and adults alike. You can bring in your coolers and chairs and set up camp for the day. Landa Park is the perfect place to spend the day – have a picnic lunch in the park, take a paddle boat ride around the lake and a train ride around the park – all before spending a few hours at the pool!